Yesterday I was thrilled & honored to have four potters from Icheon, South Korea, here at my studio to work, discuss, answer questions: Boksik Ji, Changho Ahn, Malsook Im, Jung-Gu Ham. 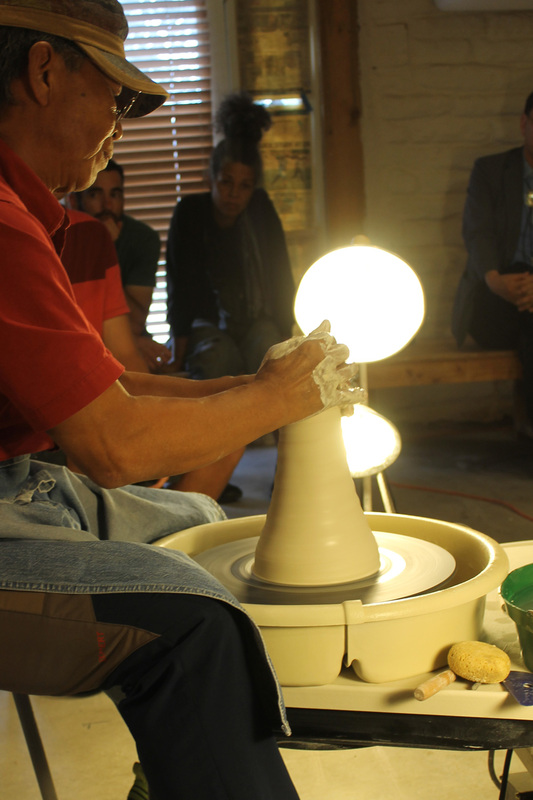 They were here in town for Art Santa Fe - as the weekend wrapped up, the four artists stopped by Green River Pottery. I had a few of Santa Fe's dedicated potters & ceramic artists collected here at the studio - we grabbed chairs, or stood, as the potters began working. The potters mostly threw 550 Porcelain, a not-very-romantic name for one of Laguna's standard claybodies, composed mostly of English grolleg. A translucent (when fired), fine, gray-white clay. Will celadon look good on it? Some of our questions & thoughts were easy to translate - some of the potters' explanations & views were no doubt lost in translation, as they say - but their philosophy, the zeal & intensity of their connection to the material & the process - working quickly, with little water, few tools - needed no translation at all.